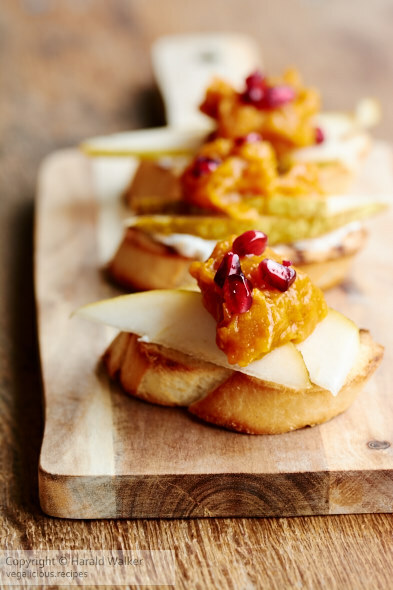 These yummy bruschetta would be perfect for any party or served as an appetizer. They are quick and easy to make and look lovely on a table as well. Slice the pomegranate in half and remove the seeds or arils. You can do this either by waking hard on the outside of the shell while holding the pomegranate half over a bowl. Or remove the seeds in a bowl of water. The seeds will drop to the bottom and the other membrane will float so that it is easy to remove. Next prepare the pumpkin spread. Place the pumpkin puree in a medium bowl. Slice the baguette in thin rounds and grill or toast. While the baguette slices are grilling, wash the pears and thinly slice. Spread some of the non-dairy cream cheese on the toasted rounds. Place 2 thin slices of pears on the cream cheese. Add a dollop of the pumpkin spread. Add a few pomegranate arils on top. Optionally you could drizzle balsamic vinegar on top, but we didn’t find it necessary. We really enjoyed these as they were. 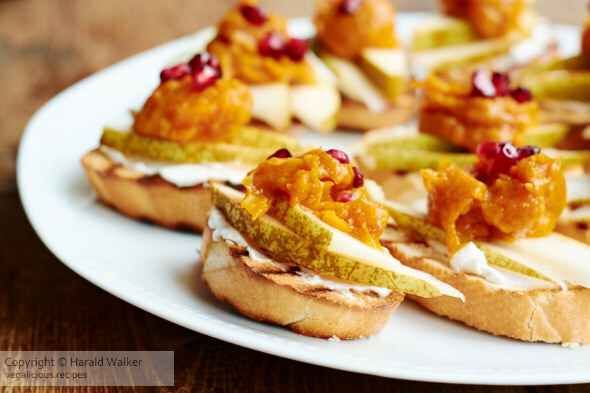 Posted by Chris Walker on November 23, 2015 in Appetizers, Pear, Pomegranate, Pumpkin.